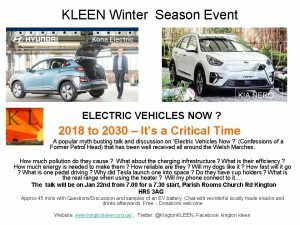 Kleen are hosting a talk and discussion at 19.30 on the 22nd of January at Parish Rooms, Church Road, Kington HR5 3AG. Join them to hear more about Electric Vehicles Now; practicality, pollution and charging infrastructure! If you’re thinking of making the change, come to this! « Sian Berry’s Herefordshire Visit!